Publication drawing. Duntrune Castle; second floor plan. Publication drawing. 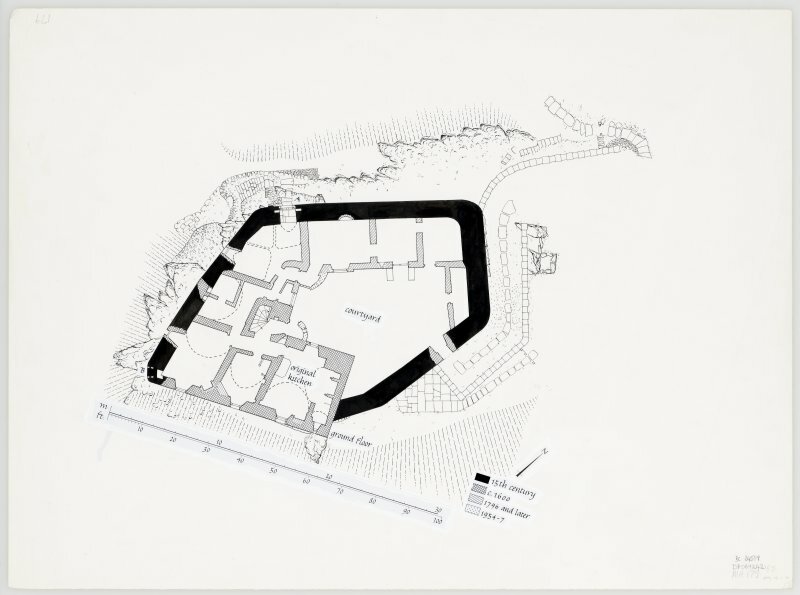 Duntrune Castle; general plan. 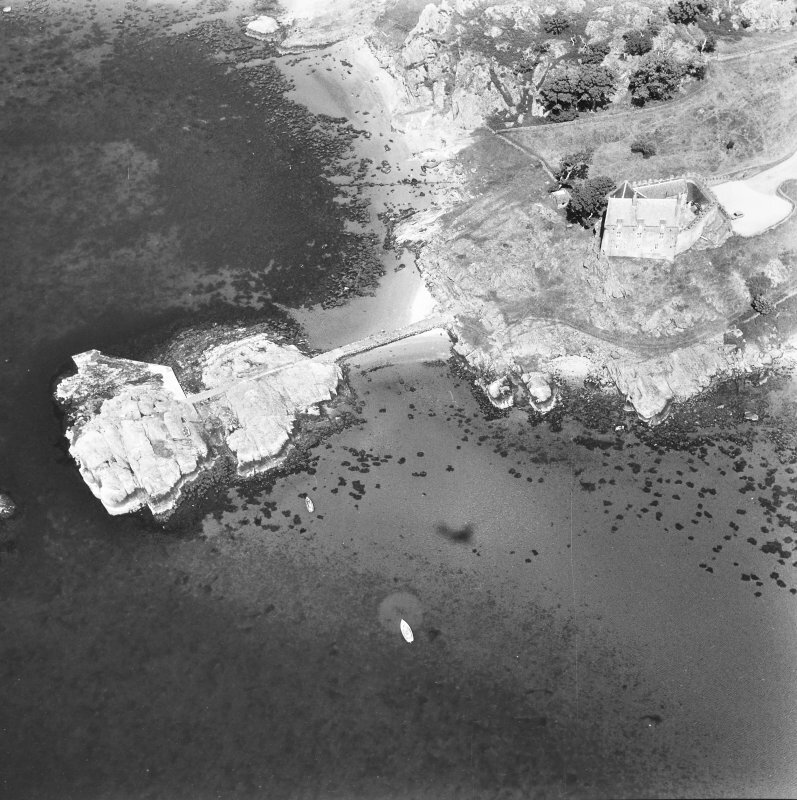 Oblique aerial view centred on the castle, garden, farmsteading and gate-piers with the remains of the fish trap adjacent, taken from the NE. 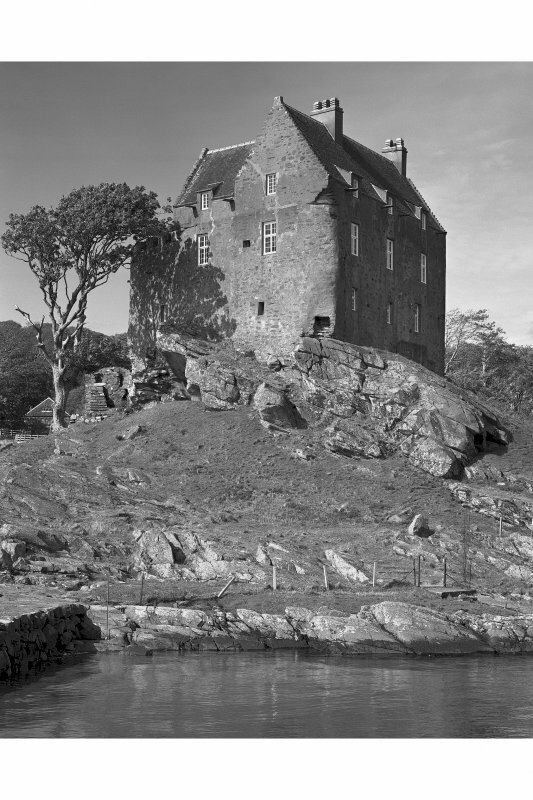 Duntrune Castle. View from South. 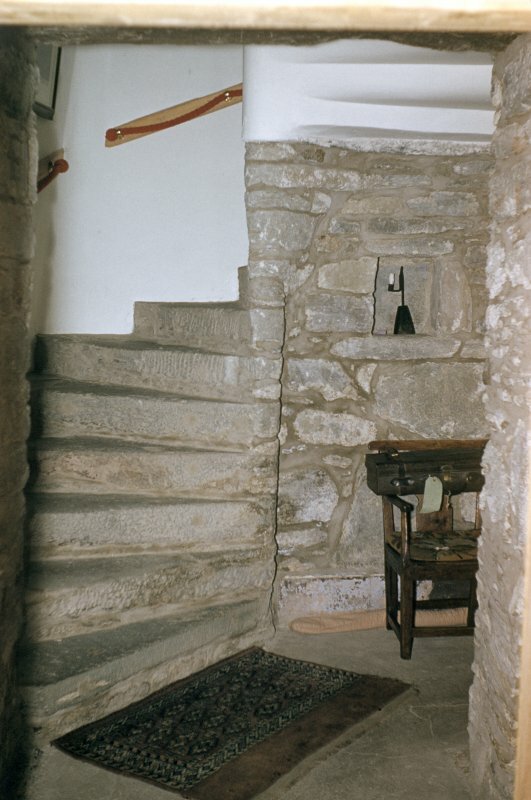 Duntrune Castle, interior. View of stair. 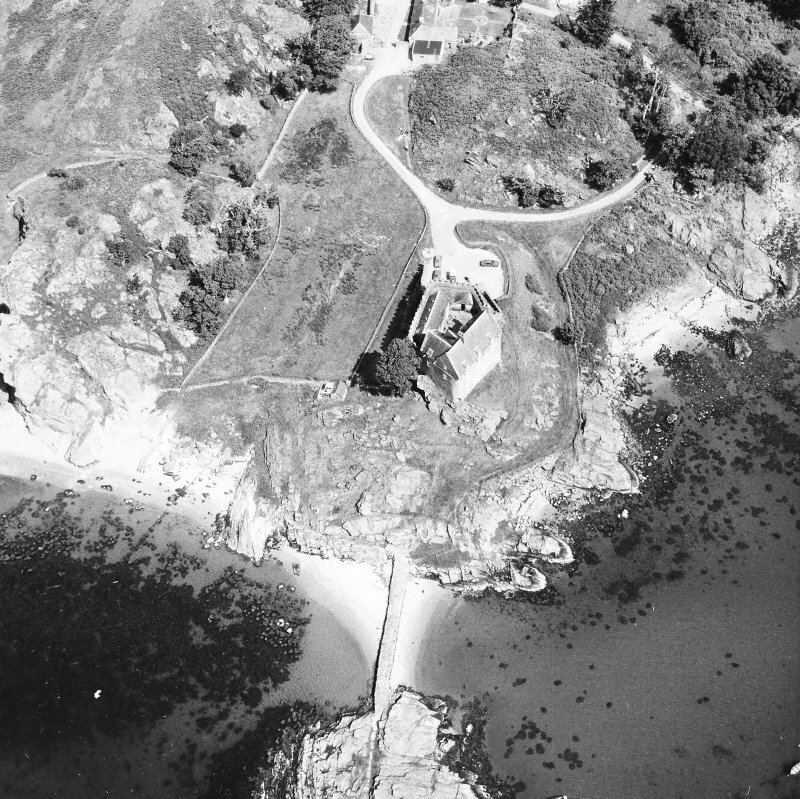 Oblique aerial view centred on the castle, garden, farmsteading and gate-piers with the remains of the fish trap adjacent, taken from the N.
Oblique aerial view centred on the castle, garden, farmsteading and gate-piers with the remains of the fish trap adjacent, taken from the E.
Duntrune Castle. 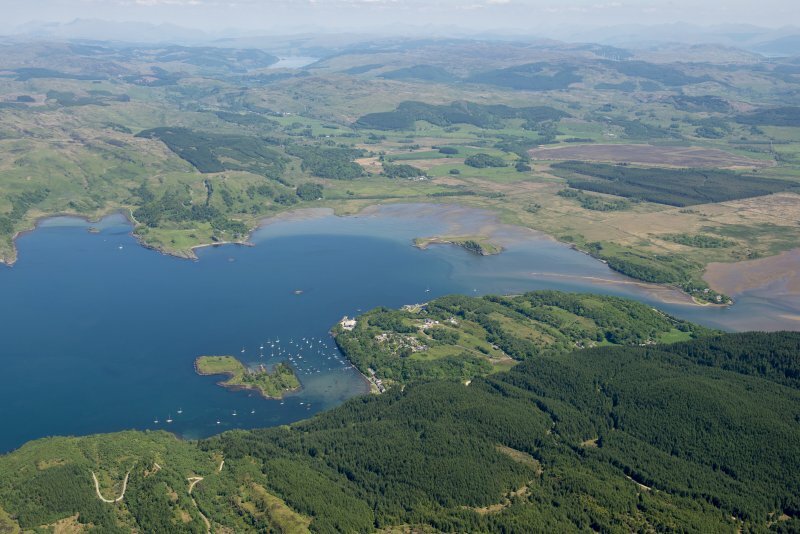 View from South (Crinan). 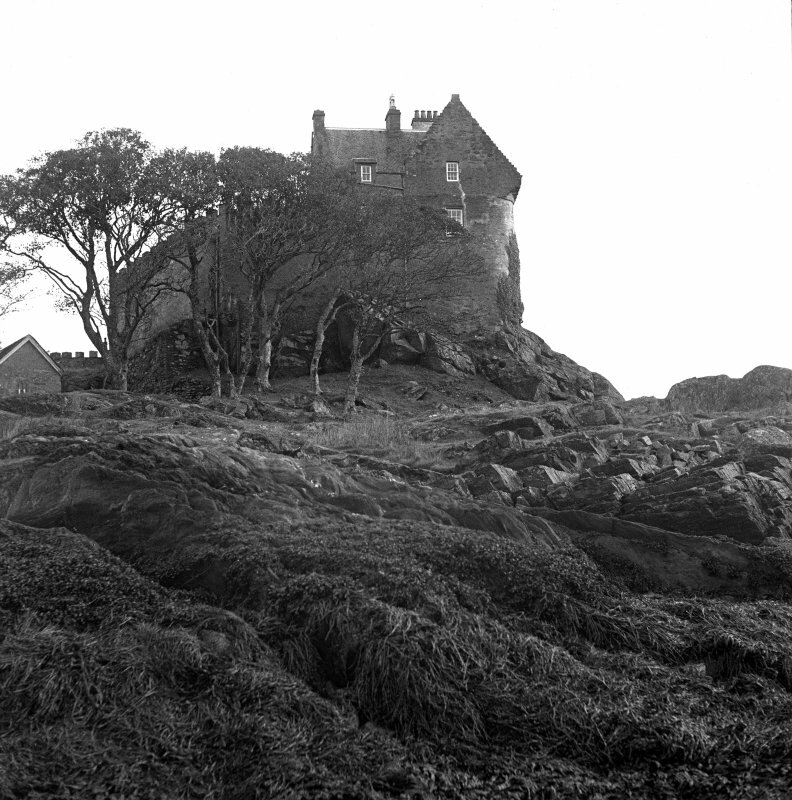 Duntrune Castle. View from North East. Distant view from E of Duntrune Castle with Highland cattle in foreground. Duntrune Castle, interior. Detail of interior of postern gateway, South West wall, ground floor. 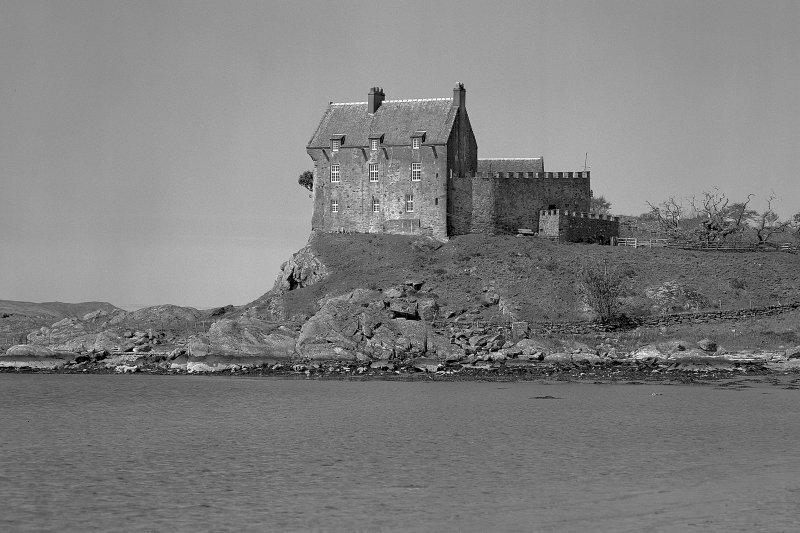 Duntrune Castle. 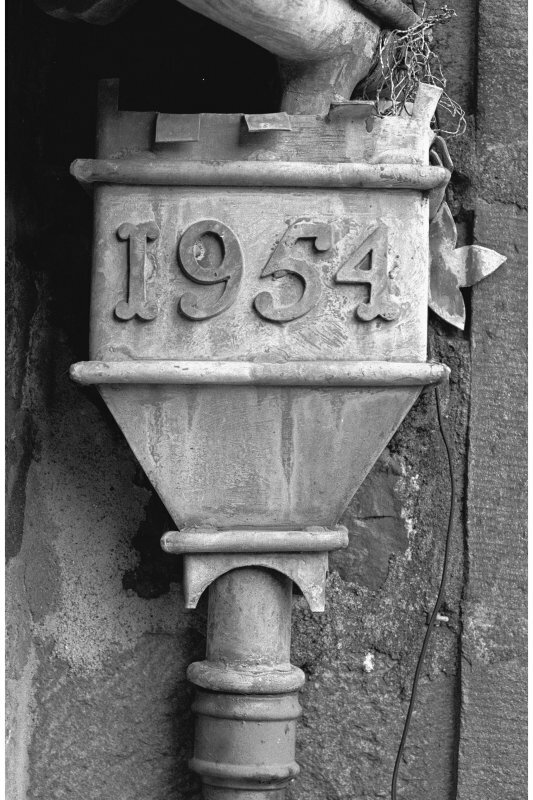 Detail of specimen rainwater head, date on head: '1954'. Publication drawing. 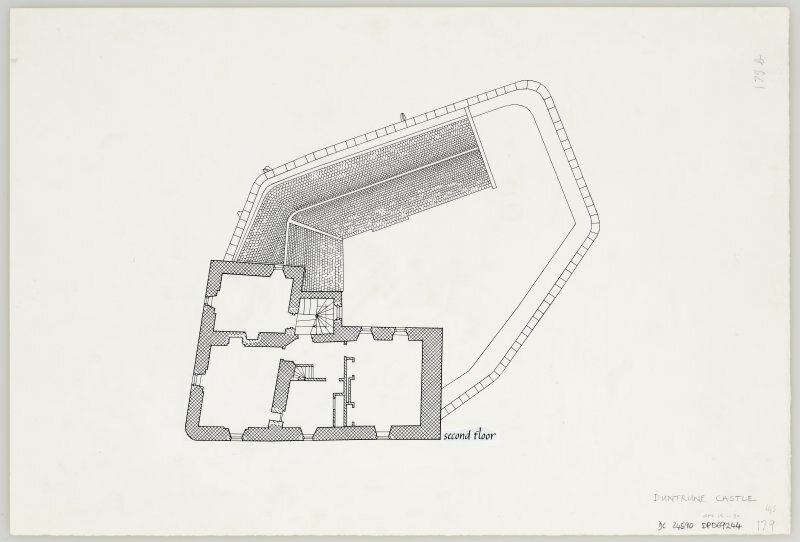 Duntrune Castle; plan. 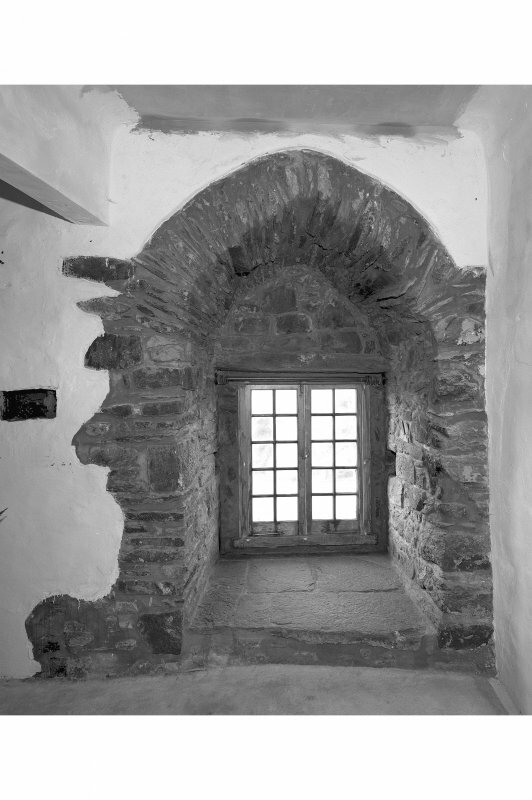 Duntrune Castle, interior. 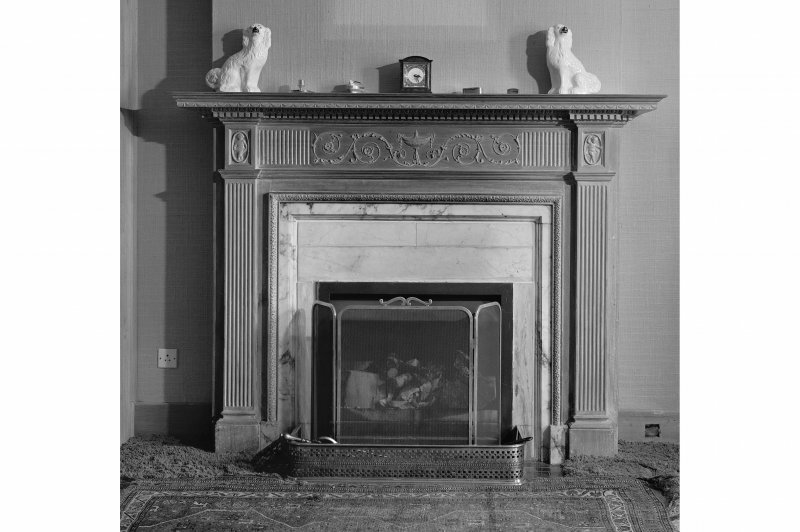 Detail of chimney-piece in North East wall of South room on first floor. Publication drawing. Duntrune Castle; first floor plan. 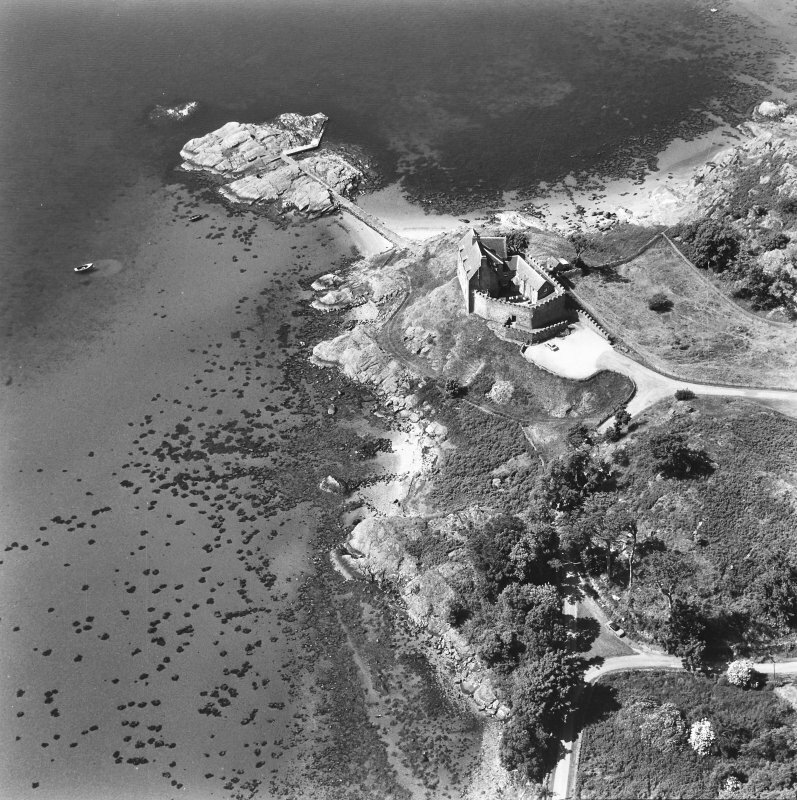 Oblique aerial view centred on the castle, garden, farmsteading and gate-piers with the remains of the fish trap adjacent, taken from the ESE. 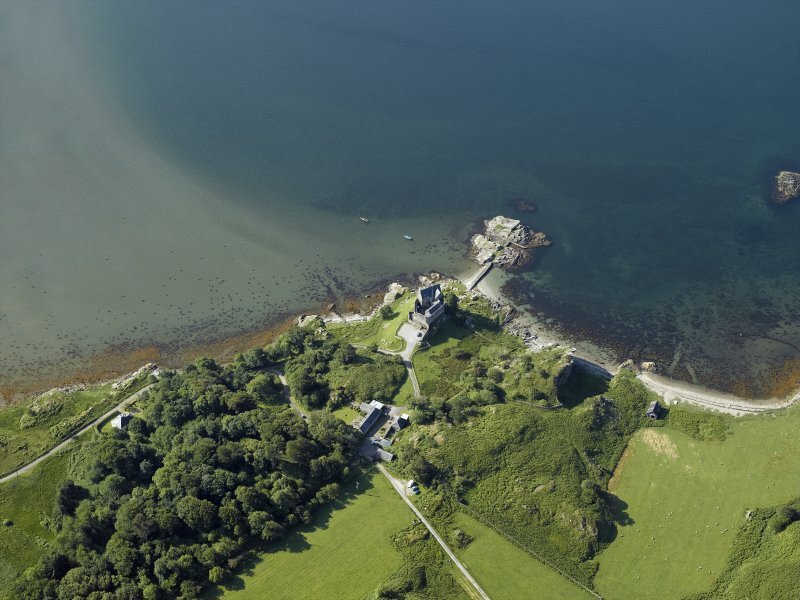 Duntrune Castle. View from East. 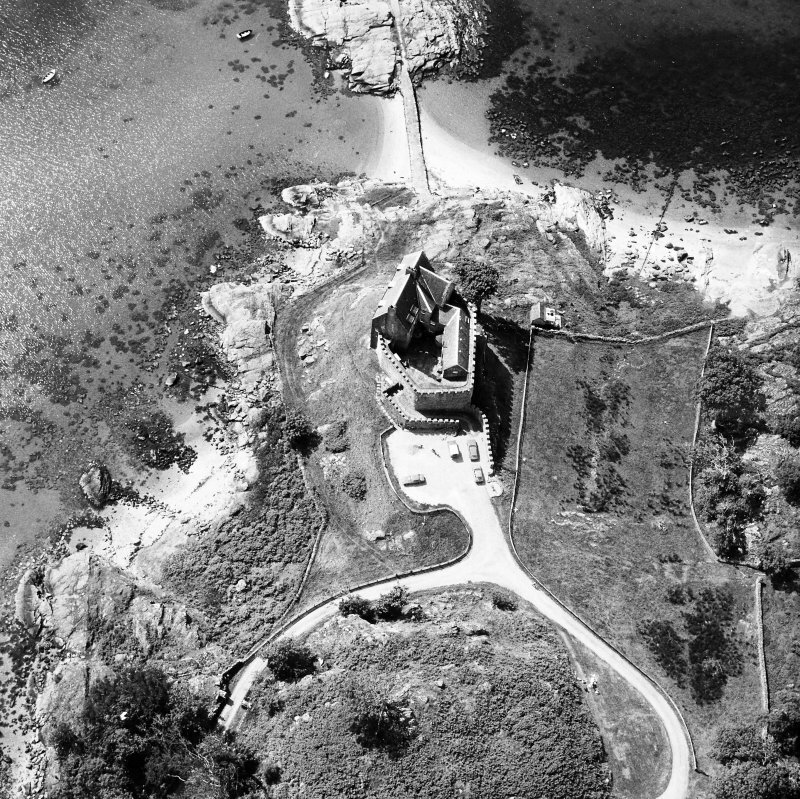 Oblique aerial view centred on the fish trap with the castle and gardens adjacent, taken from the SW.
OS 6" map, Argyllshire, 2nd ed., (1900). 1 newspaper cutting - missing at time of upgrade (10.9.1999). 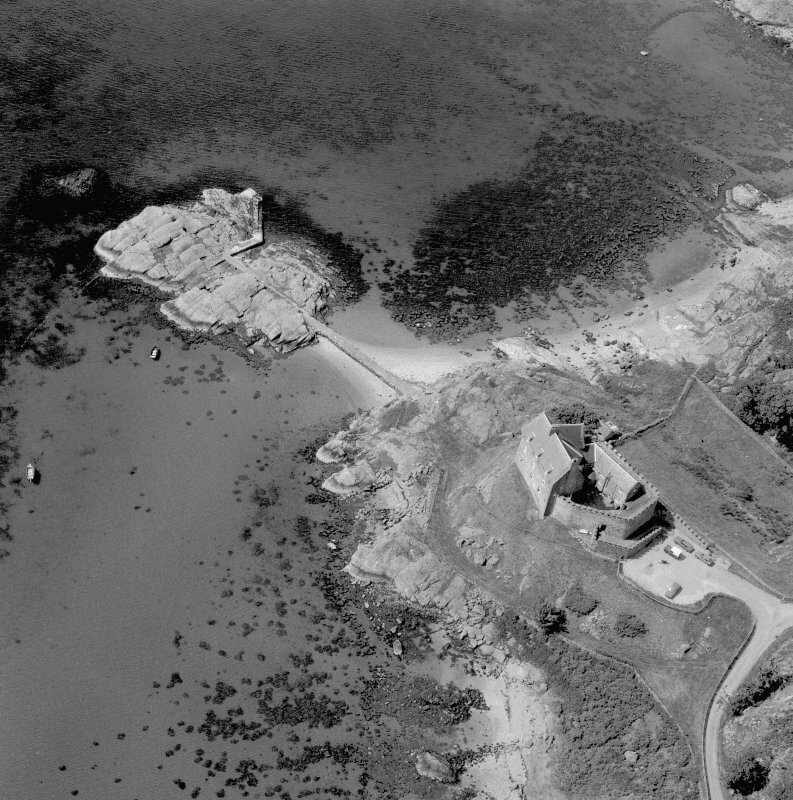 Castle visible on oblique air photograph - CUCAP JS 71 1. 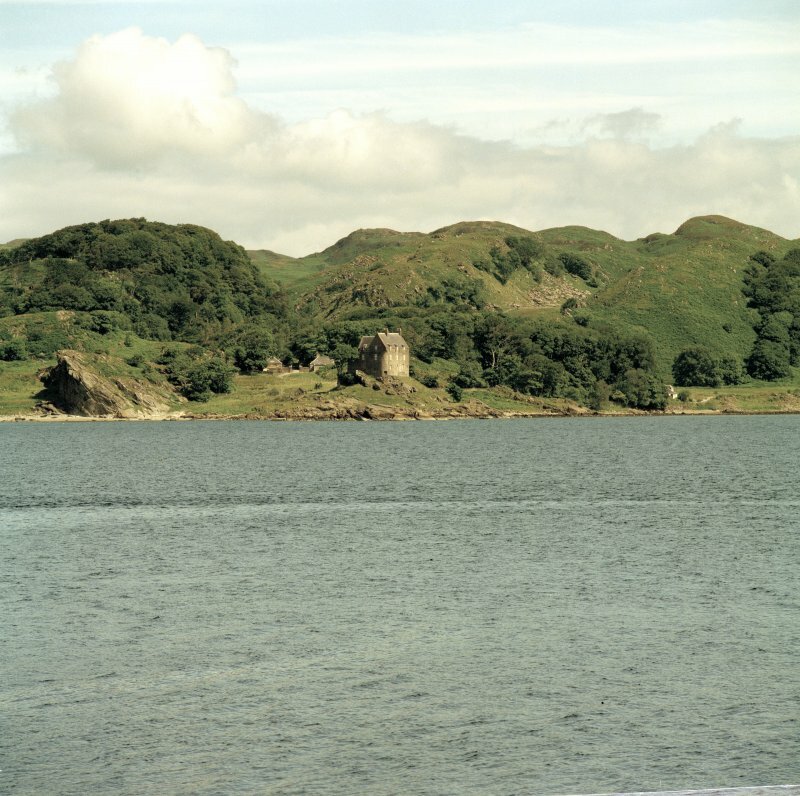 Duntrune Castle (information from OS) occupies a promontory projecting into the N side of Loch Crinan. 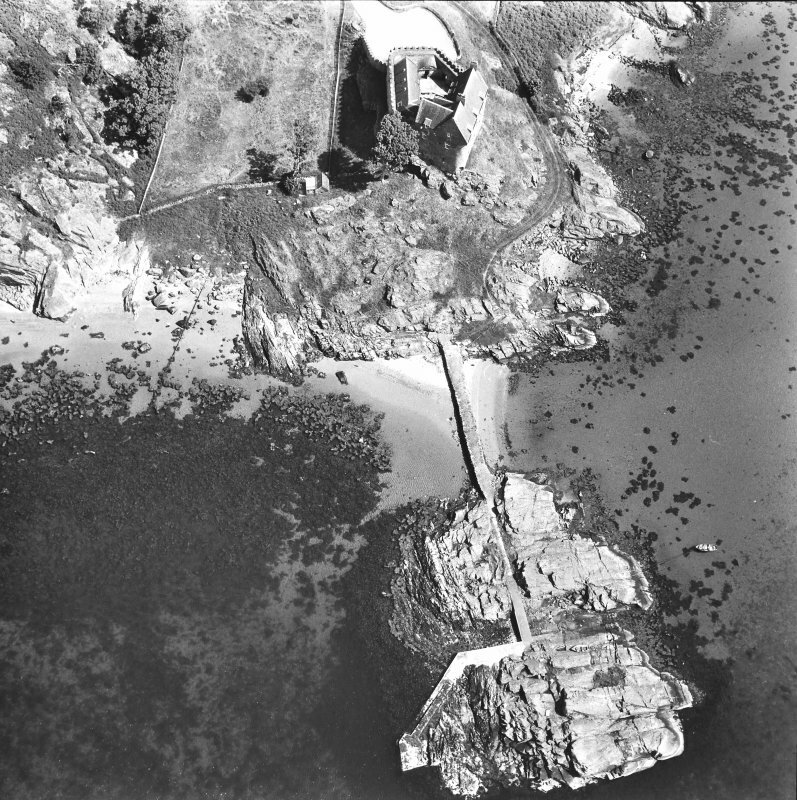 It comprises a 13th century enceinte wall, 6' thick, 24-28' high, enclosing an irregular area 70' by 50'. The entrance is in the NE and has been strengthened later by a lower wall, forming a narrow way round two sides of the enceinte. 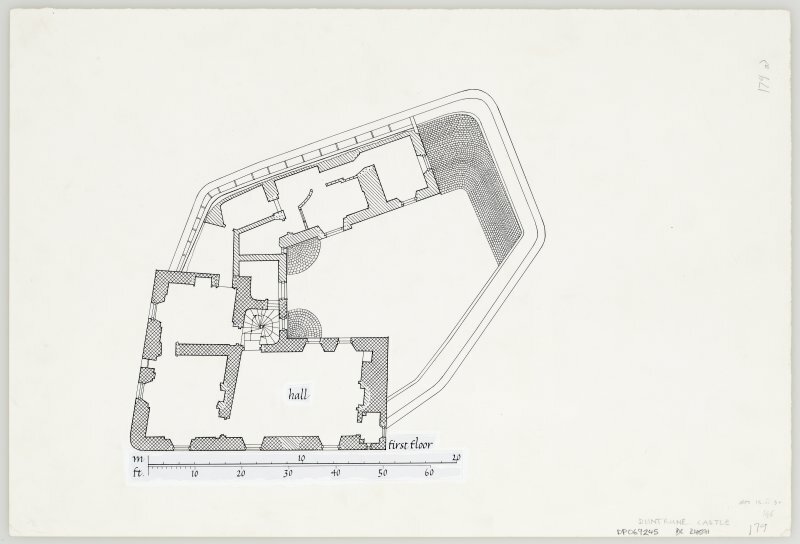 A 17th century L-plan house stands in the S angle of the courtyard, evidently on the site of an earlier one, incorporating part of its walls. This has few important features, the roof having been modernised. but the crow-stepped gables survive. 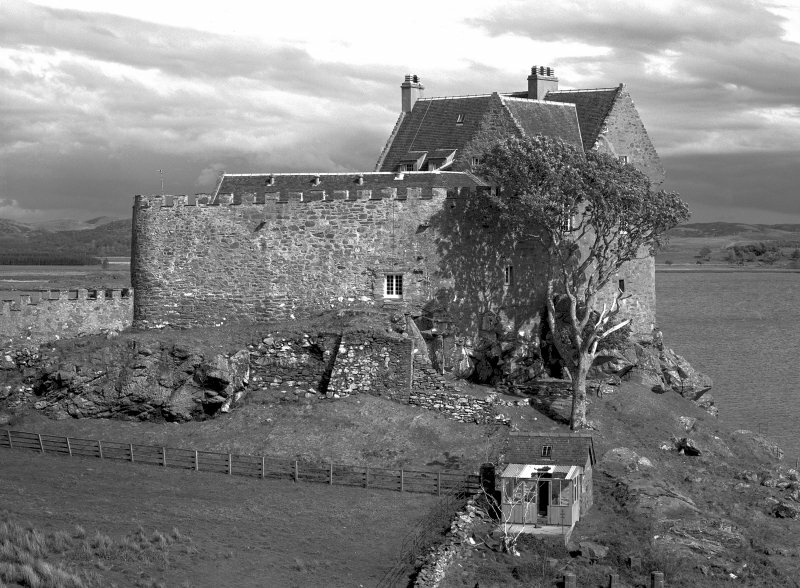 It is now a private residence, and was the seat of the Campbells of Duntroon, besieged by Colkitto or his son Alasdair in the 17th century. 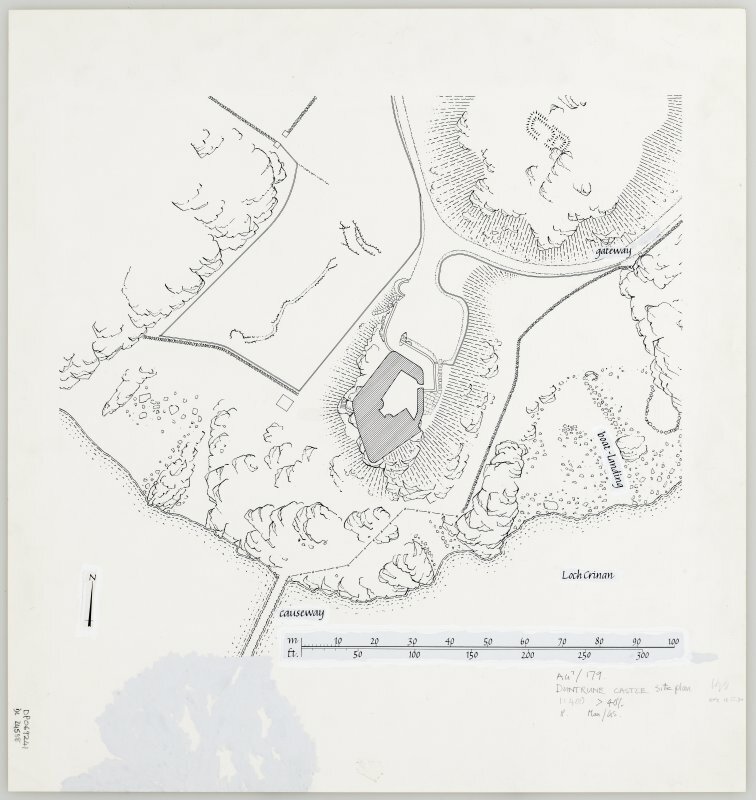 It may occupy the site of an earlier (prehistoric) fort (Campbell and Sandeman 1964). NSA 1845; D MacGibbon and T Ross 1887-92; S Cruden 1960; M Campbell and M Sandeman 1964; Information from Col G Malcolm, owner. 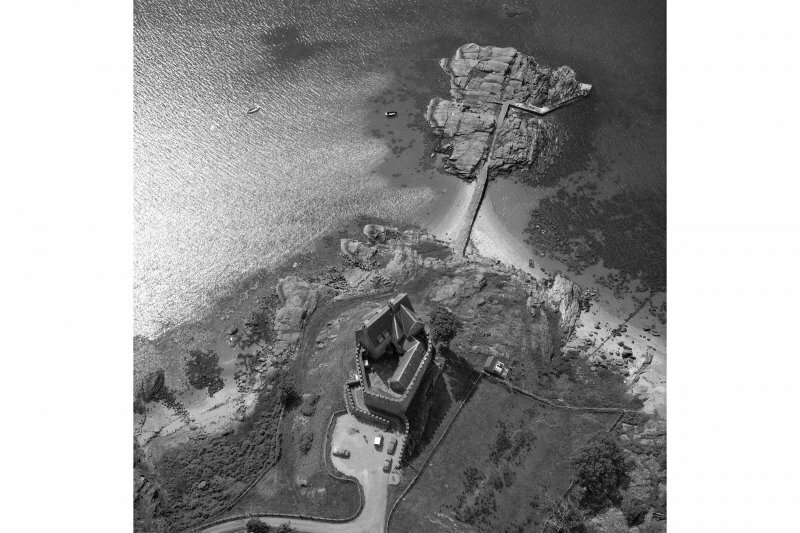 'Duntrune Castle' is as described above. 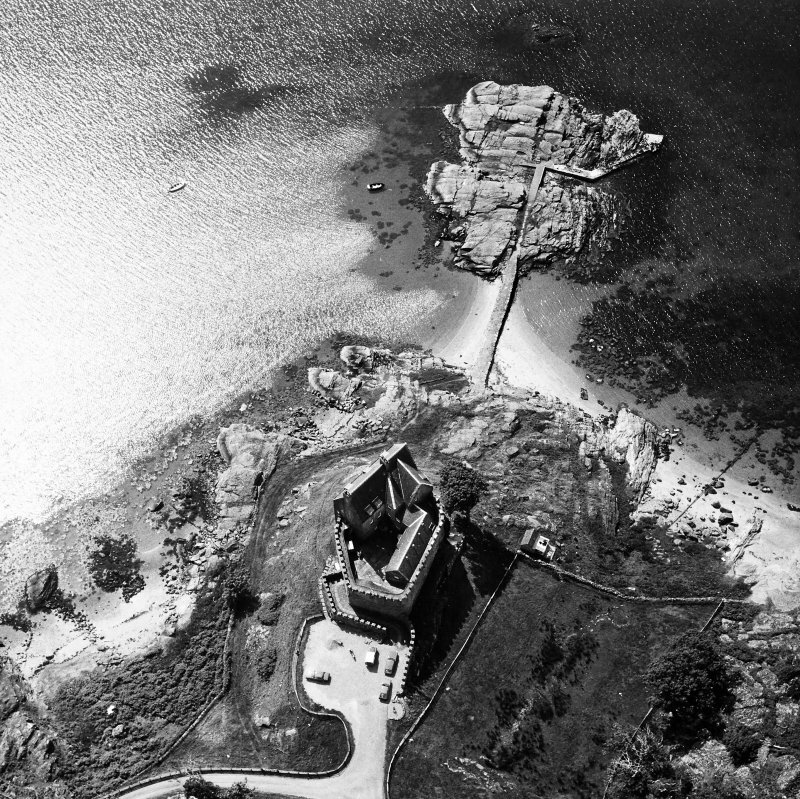 There is no evidence of an earlier fort. 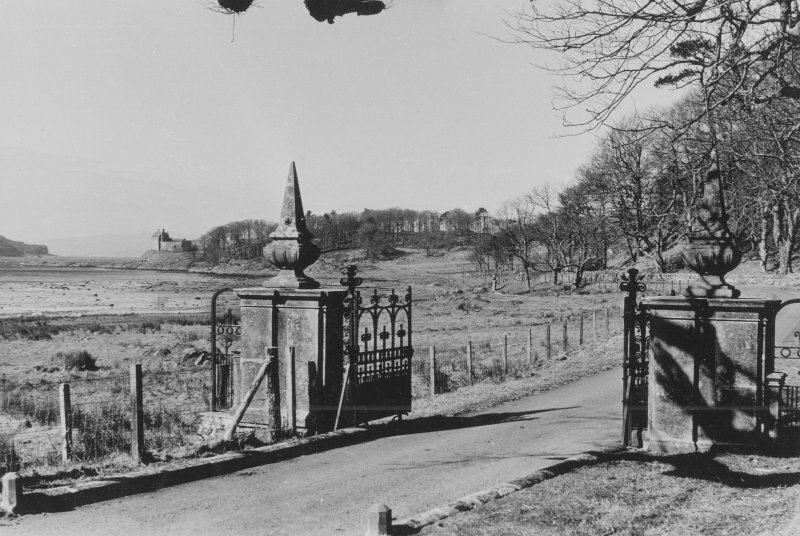 Visited by OS (RD) 6 April 1970. As described in the previous information. Visited by OS (TRG) 26 January 1977. 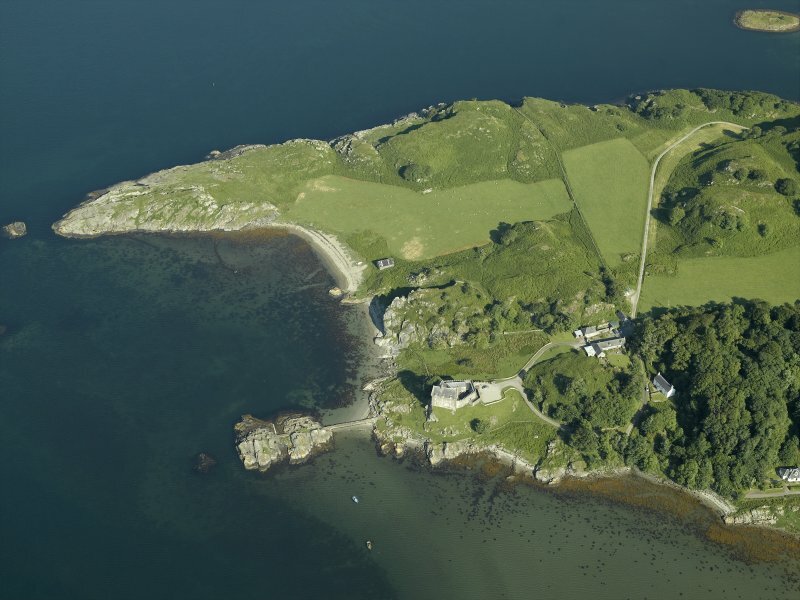 This castle stands on a rocky promontory on the N side of Loch Crinan commanding a wide prospect on all except the N and NW approaches. 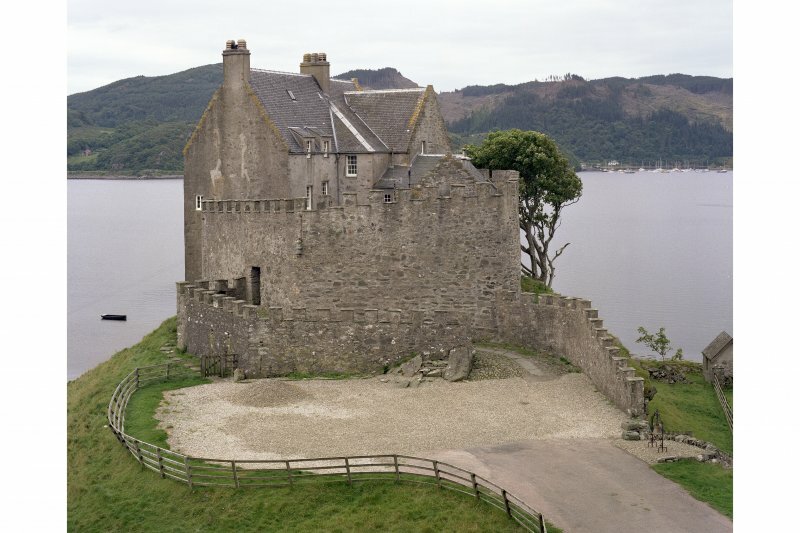 To the S of the castle the promontory extends into the loch as a low rocky spit reached by a causeway and usable as a boat-landing in calm weather. 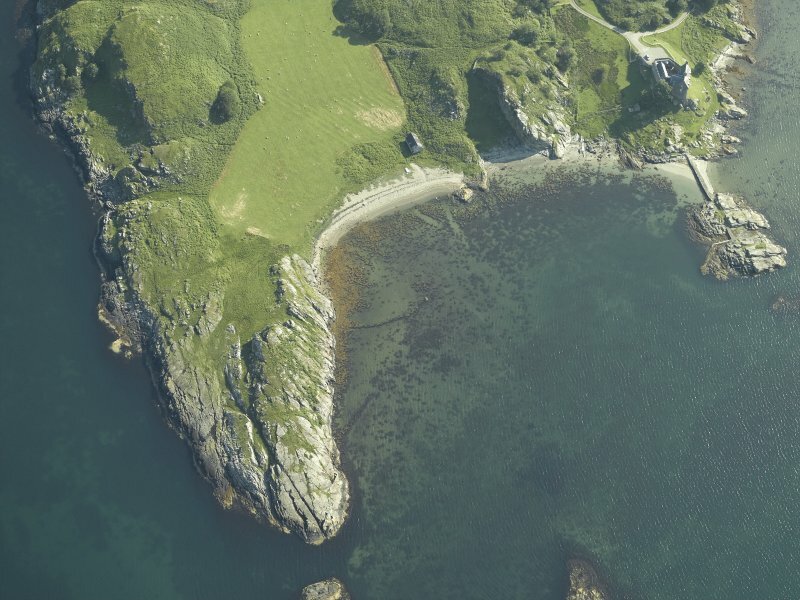 There is a more sheltered beach and boat-landing on the E side of the headland. 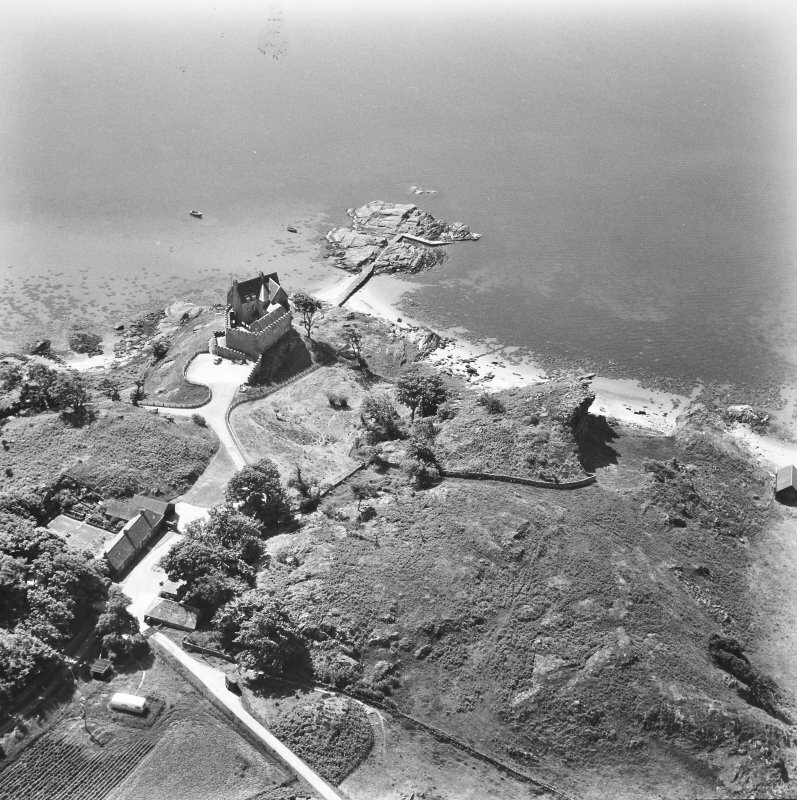 The landward approach is now by a driveway and an artificial terraced platform, but the castle may at one time have been protected by a natural gully or ditch, separating it from a higher knoll to the NE. 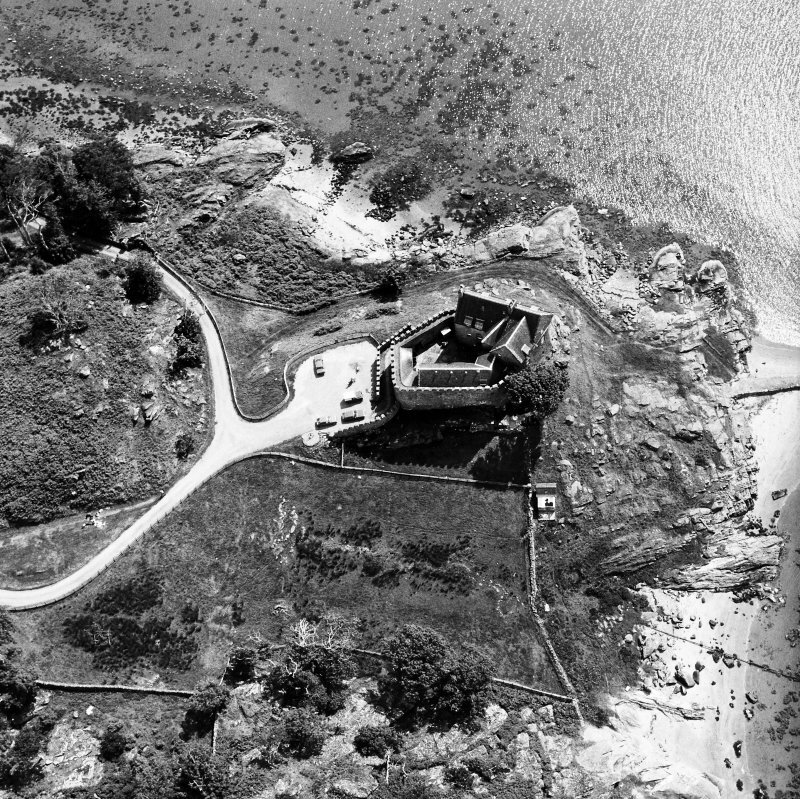 There are the footings of an oblong building of bicameral plan and indeterminate age on the summit of this knoll. 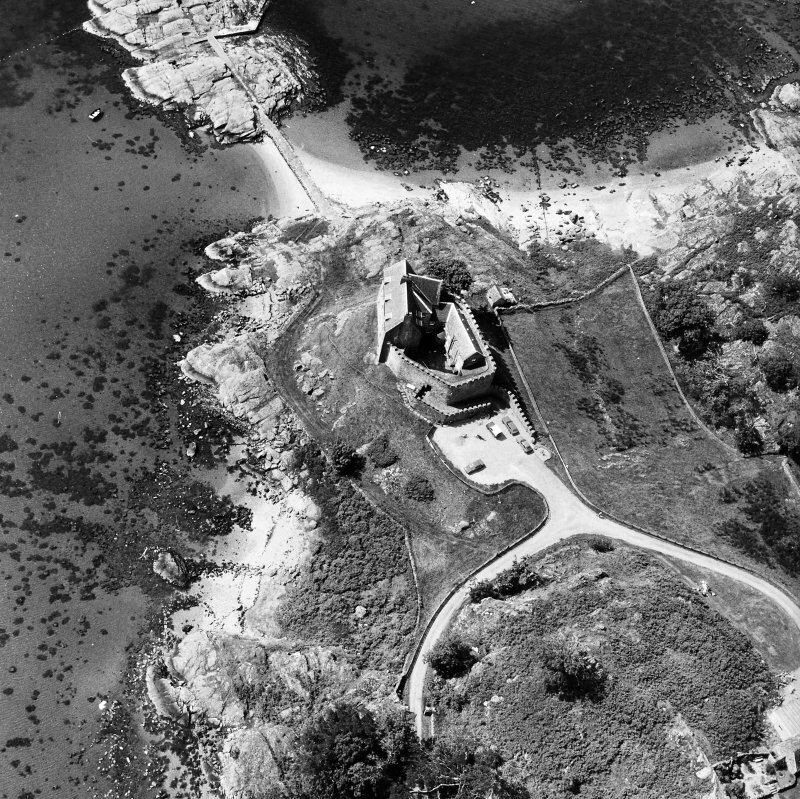 The castle consists of an irregular round-angled polygonal enclosure incorporating a three-storeyed L-plan tower in the S angle. It is roofed and inhabited, and modern ranges of buildings extend along the internal NW and NE faces of the courtyard. The sequence of building is reasonably clear, but precise criteria for dating the earliest phases of construction are lacking. 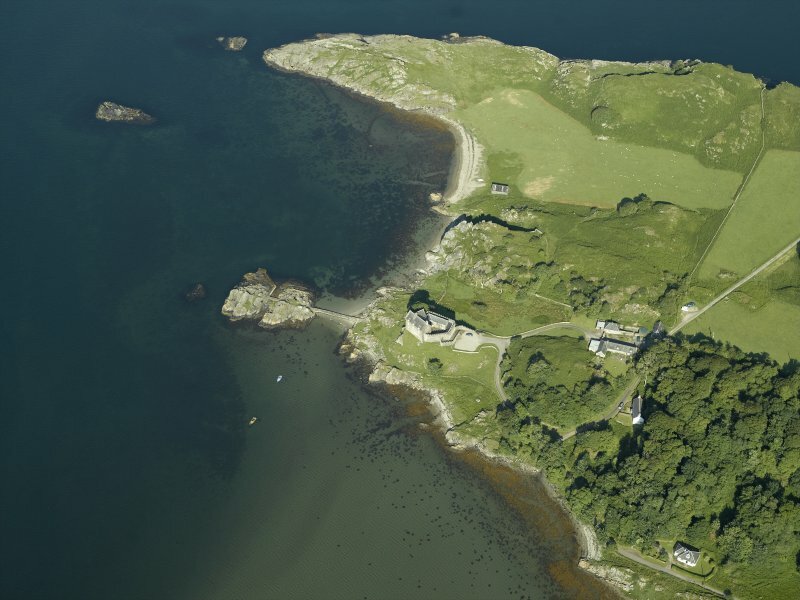 The enclosure itself probably belongs to the late medieval period, and the general layout and character of the castle are more analogous to the 15th-century Breachacha and Kisimul Castles than to earlier enclosure-castles such as Mingary and Tioram (en.1). 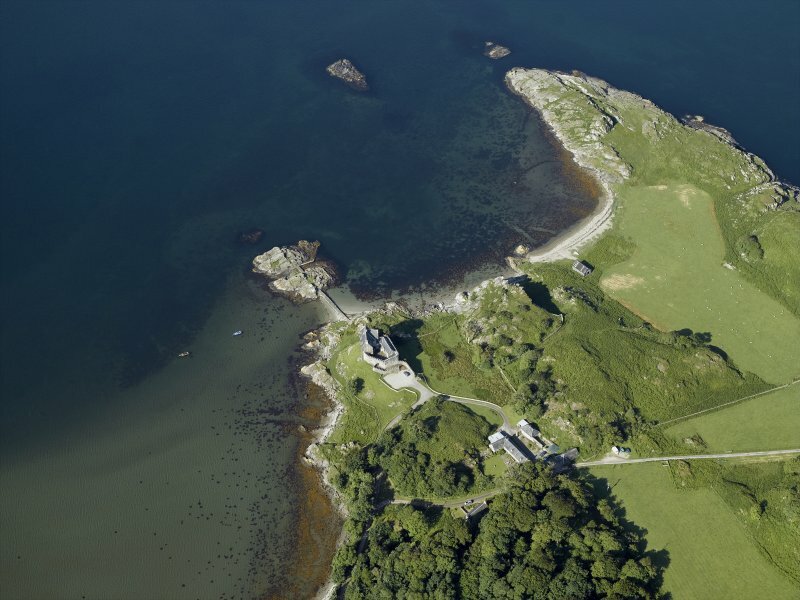 The existing tower-house can be ascribed to about 1600, probably replacing an earlier structure in a similar position, and the manner in which it has been built against and over the top of the earlier enclosure is particularly evident on the SW wall. 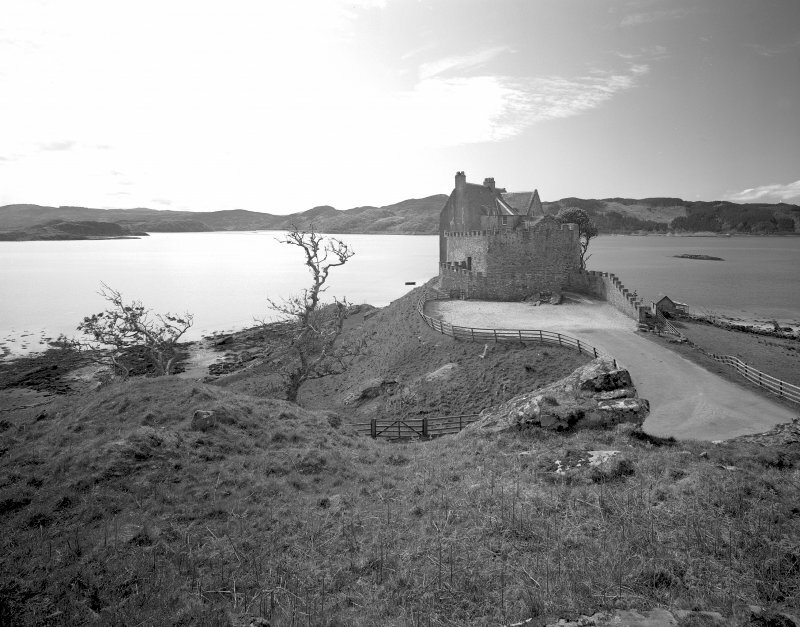 A scheme of restoration and alterations was undertaken after 1796 when the castle was purchased by Neil Malcolm of Poltalloch. 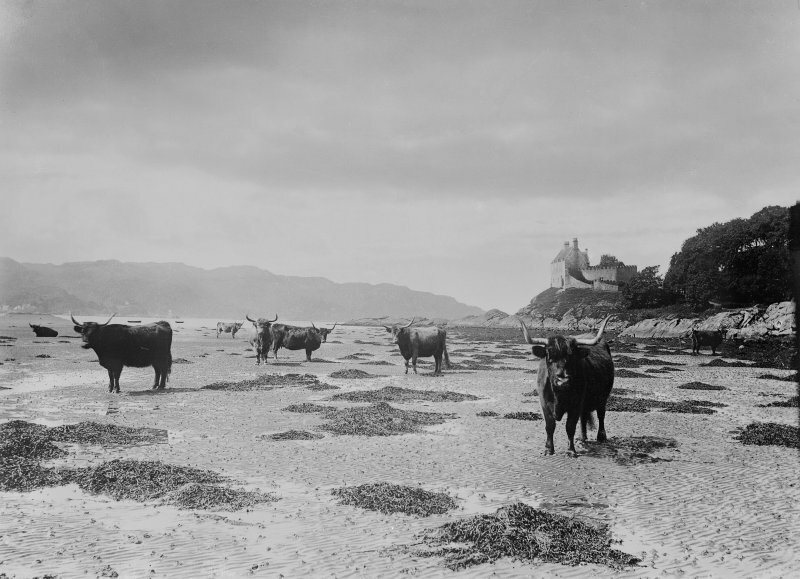 Following the abandonment of Poltalloch House (No. 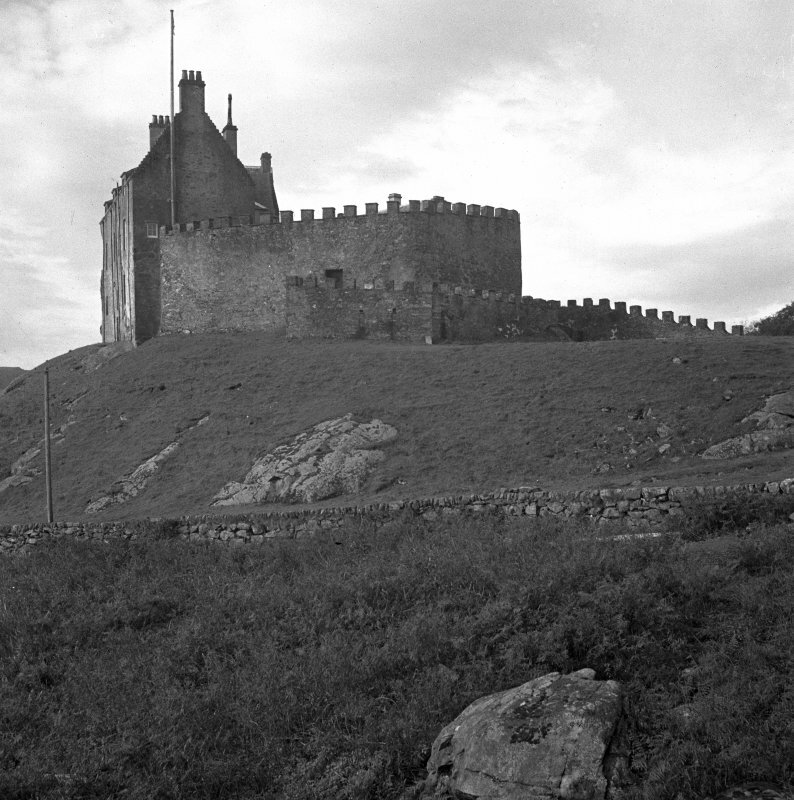 177), the buildings of the castle were further modernised and extended between 1954 and 1957 by Col. George Malcolm of Poltalloch.